The area was settled begining in the 1850s by immigrants from Scotland and Ireland, arriving on the Toronto-Syndenham Road (present-day Highway 10 to Owen Sound) for free 50 acre wooded lots (50 acres free, and 50 acres at 50 cents an acre). 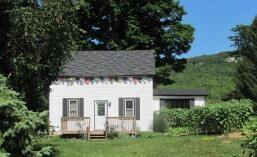 Within four years a settler had to clear and plant 12 acres, and built a house 18 by 20 feet. The farming was hard, the winters long. These first settlers would have included the grandparents of Edith Camack, who lived in the house from the 1920s until 1960. 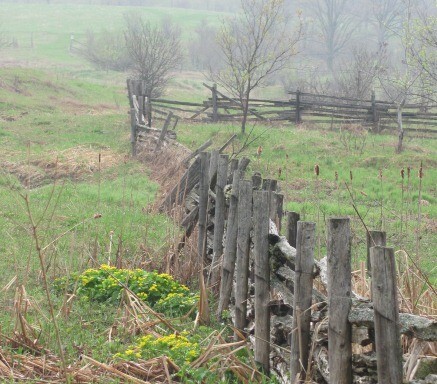 You can see an original sunken pioneer road on the Bruce Trail near the hamlet of Vandeleur. The first settlers wrote of amicable relations with the local First Nations population in the Beaver Valley in the 1860s, but then the First Nations People gradually disappear from the local historical record, pushed to the reserves further up the Bruce Peninsula. You can read more here about the First Nations people in the area. Pioneer fence behind the house. The Beaver Valley was a fertile place to trap and hunt, with plentiful fish in the river, deer, beaver and some shelter from the harsh winter. The forest was made up of maple, elm, beech, basswood, with cedar and tamarack in the swamps (Split Rail Country, p. 5). As farmland, it was stony and the growing season was short, but apple trees thrived and have been producing good crops since the 1860s. Early agricultural products included wheat, hay, maple sugar, barley, peas, oats, pork, wool, potatoes, butter and turnips. (Split Rail Country, p.5). Today you will see cattle grazing, apples and some crops like corn, and the Beaver River is still a great spot for fishing. The valley was also called the Cuckoo or Coo-Coo valley, either after the black-billed cuckoo bird that lives in the area or after the fools who came to the Eugenia area in the 1860s as part of a gold rush, only to find fool’s gold. The history of black settlers in the area is not as well known. Owen Sound (Sydenham) was the end of the Underground Railroad, and black settlers arrived in Grey country to establish small villages and clear the bush for farms. It is estimated that there were about 2,000 black settlers in the Queen’s Bush at one point. They mainly settled in Owen Sound and Collingwood, but the closest black settlements to Kimberley were Priceville and Ceylon, south-west of Flesherton. The tragic story of the black settlers in Priceville was all too common – they cleared the land and established farms, but were never granted proper deeds to their land. The government then gave their land from under them to white settlers. These courageous black settlers were segregated from whites, and established their own churches, schools and social support. A number worked in shipping on Georgian Bay. 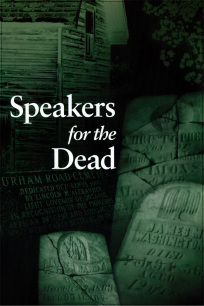 A film by the National Film Board, Speakers for the Dead, tells the story of the community in Priceville. The Beaver River runs through Beaver Valley to Georgian Bay at Thornbury, passing over two large waterfalls on the Niagara escarpment: Hoggs Falls and Eugenia Falls. The water power was key to the settlement of the valley. By the end of the 1860s there were five mills in nearby Eugenia alone, powering a saw mill, grist mill, stove and barrel factory, and a casket factory. In the 1870s William Hogg, of the Hogg family which farmed in Hoggs Hollow near York (present-day York Mills in Toronto), left the family farm to seek his fortune in Eugenia. Hoggs Falls bears his name. Hogg was well read and saw the potential of the large waterfall in Eugenia. By 1895 he had built a small hydro-electric power plant with a water wheel to provide enough power (70 KW) to bring light to Eugenia and Flesherton and run a chopping and a grist mill. He travelled to Toronto to propose to sell power to Toronto for their new electric streetcars, but in the end the deal went to Niagara Falls. Nevertheless, the grand scheme of a large hydro-electric plant was born. 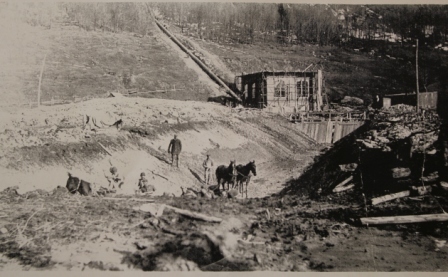 Eventually a group of entrepreneurs built a 1700 foot long dam, 50 feet high and 3 feet deep and flooded 1700 acres, creating Lake Eugenia. Undeterred by the First World War, they ordered the first set of two turbines from Switzerland, but the ship carrying them was torpedoed by a U-boat outside the St. Lawrence. A second set arrived eventually from Wisconsin. For decades the plant supplied power to a large area from Owen Sound to Orangeville, Durham, Mount Forest, Chesley, Wiarton, Walkerton, Grand Valley, Arthur, Collingwood and eastwards. The dam was rebuilt in 1962 to save the lake, which has become a pleasant recreation area. The current power plant is still in operation. The plant feeds 3500 kilowatts into the Ontario grid. Wooden stave pipes carry water from Lake Eugenia, the storage basin, to the surge tanks at the lip of the valley. These tanks absorb any surges of water and prevent vacuums from forming and collapsing the pipes. The water then drops through a steel penstock to the turbines that feed two fully automated units. These operate unattended 24 hours a day, 365 days a year. The difference in height from intake up at the lake to the tailrace water beyond the plant is 168 metres, giving Eugenia the highest head in the Ontario basin. Much of this history of the area has been gleaned from Split Rail Country: A History of Artemisia Township by Mildred Young Hubbard, the Sea and Ski website and Grey County Museum website. Read more about history of the area.